The hypothalamic-pituitary adrenal (HPA) axis is one of the most important endocrine stress systems in humans. The HPA axis is activated upon the advent of a stressor, and as a consequence a cascade of hormones is released that serve different functions throughout the human organism, generally aimed at providing the necessary metabolic and immunomodulatory adjustments in response to a physiological or psychological stressor. Basal secretion of the endproduct of the HPA axis, cortisol, follows a circadian rhythm, with the highest levels early in the morning and the lowest levels at night. Moreover, when released in response to stress, cortisol induces a negative feedback in the central nervous system (CNS) to terminate activity of the HPA axis when the stressor is no longer present. This normalization of activity is believed necessary to protect the organism from the long-term detrimental effects of chronic activation of the HPA axis. Normal aging is accompanied by a number of changes in the regulation and activity of the HPA axis. Basal cortisol levels, especially at night around the time of the nadir, are increased, and feedback sensitivity to cortisol at different levels of the CNS is decreased. The hippocampus is discussed as one of the structures involved in the changes of HPA regulation with aging. Receptors for glucocorticoids are primarily located in the hippocampus, and recent evidence suggests that basal cortisol and ACTH levels might be inversely associated with hippocampal volume, and thus might be at the origin of the age-related changes. Moreover, it has been shown that the inhibitory effect of glucocorticoid feedback on subsequent activity of the HPA axis is diminished in elderly subjects. Recently, we investigated cortisol levels during human aging together with CNS structures and personality variables. 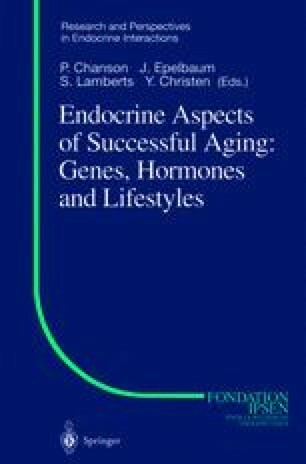 It appears that aging is not predictive of HPA axis regulation and structural CNS changes per se, but that specific personality types are less affected by age-related changes of the CNS and HPA axis regulation.